In 2000, the General Services Department (GSD) was established to construct and maintain the City’s building portfolio. Since that time, GSD has evolved into a full service, client-centered department that provides a comprehensive suite of services to over 300 facilities; representing 7.7 million square feet of occupied space. As a full service department, GSD assists its clients in identifying the appropriate real estate solution and then provides design and construction services for the development of the facility. Once the facility is ready for occupation, GSD provides energy, property and security management services to ensure the lights come on and the facility is clean, well-maintained and secure. To further enhance the operation of its facilities, GSD established the Sustainable Growth division. This division is responsible for implementing green and sustainable property and energy management solutions with the intent of reducing operating costs and improving client satisfaction. GSD is client-focused, customer-responsive, and is committed to customer service and excellence. At the forefront of our commitment is our motto: "Pursuing Customer Satisfaction...Always Responsive". May 17, 2017 -- Today, Mayor Sylvester Turner, along with members of Houston Council, voted unanimously to confirm the appointment of Clyde J. "C.J." 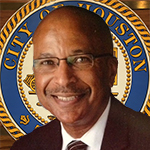 Messiah, Jr., as director of the General Services Department for the City of Houston. "I have had the pleasure of working with C.J. over the last year," said Mayor Turner. "He is a man of his word and knows how to get the job done, and I am confident in his ability to lead this Department. I look forward to working with C.J. and the great City employees that work in the General Services Department to ensure that the lights come on in our buildings and that our facilities are clean, well-maintained and secure." Mr. Messiah has served as interim director of the department since November 2016 and joins the Mayor's executive team with more than two decades of law enforcement experience. Mr. Messiah had been the deputy assistant director in charge of security for the General Services Department since June 2016. As director of the General Services Department, Mr. Messiah is tasked with coordinating the preparation, implementation and monitoring of the department budget, training employees and establishing policies and procedures for the department. Mr. Messiah has more than 23 years of experience with the Houston Police Department and served as Sergeant of the Mayor's Protection Detail Division for 11 years. Mr. Messiah also served as Technical Sergeant, Staff Sergeant and Airman Sergeant in the United States Air Force. He is a Veteran of the U.S. Air Force and has worked as a security consultant with the Major League Baseball Organization for 16 years. The General Services Department oversees maintenance, construction and security management services for more than 400 city facilities.